Wake up to these babies. They are light, fluffy and perfect – and chock full of apples and spice. They taste like autumn, especially when eaten with an apple-cranberry-rosemary sauce. Or apple butter. Or smeared with cherry jam. Even plain, these biscuits are the bomb. Get the hot little recipe over at Poppytalk. these sound delish! i'll have to make some this weekend! wonderful! I bet these were a winner in the morning time. Love it. hi, i like the recipes but i'm not completely sure i'm doing it right. what do T, t and tn mean? just to make sure i mix the right amount of ingredients. thx!! Thanks so much Johanna! Sometimes when the light is right, my photos look half-way decent. Renee, these are perfect weekend treats! Thanks Dawn, winners they are. Ties, sorry it's my chicken scratch shorthand. T = tablespoon and t = teaspoon. Enjoy! wow! sounds so yummy. great food photography. As far as Im concerned Apple + Cinnamon = Pure Bliss! Thanks a bunch! I intend to bake a big batch this weekend. Sounds like that's a biscuit worth getting out of bed for. Yum! Light, fluffy and perfect (and warm!) is just what my stomach needs in the a.m. …should start making some nice eats for breakfast instead of the usual standby of cereal. These look so yummy. If you don't mind my asking, where did you find Bramley apples in Vancouver? look amazing, know exactly what I'm baking tonight now! Well, enjoy them thoroughly with jam, Amanda! Thanks Elfin, I hope you enjoy. Bijoux, cereal is fine and all, but sometimes you've got to mix it up. Alicia, this weekend we went to Langley to buy pumpkins and apples. The Bramley apples came from Dave's Orchard (I think). Ciara, I hope you love 'em as much as we did. My mother grows apples which are the most beautiful things for baking with. I'll have to get some pronto and make these! Mmm those biscuits look absolutely perfect with crispy little edges. Dailyspud, I hope you enjoy these with your mom's apples! Hey, I found the piloncillo on Granville Island at that shop! So pleased. Ohhhh yum! Those sound fantastic!!! Love the apple-cranberry-rosemary sauce too, that sounds divine! Great combo for biscuits! 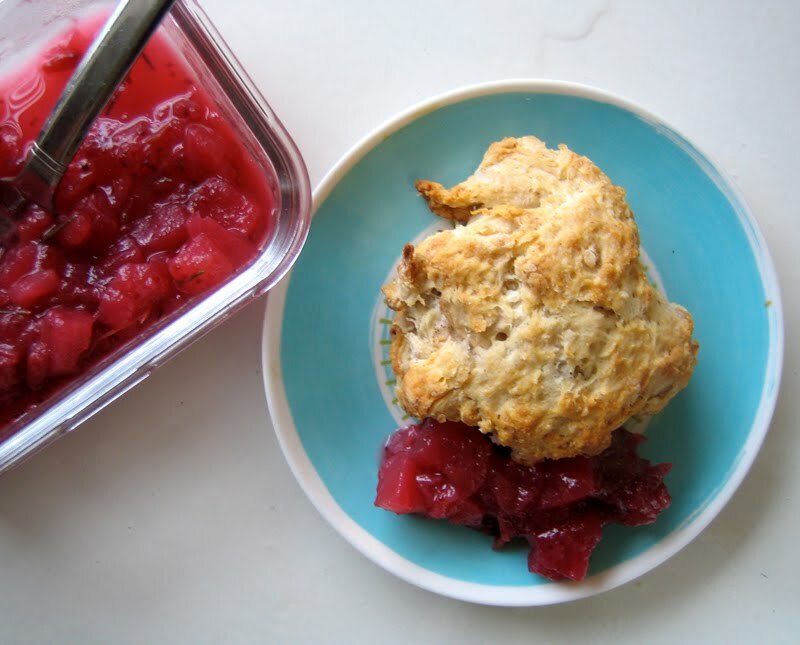 Is there anything better hot in the morning than biscuits? Lead me to them! i would love to wake up to your biscuits – they look gorgeous! They look gorgeous and I love the splash of color from the apple cranberry rosemary sauce. Do you have a recipe for that? Damn! I should have totally made these this morning instead of this pathetic excuse for an apple muffin. What the fabulous treat to tuck in your bag for a midmorning snack. Love the idea of them with cranberry sauce. Off to bookmark the recipe. CookiePie, thanks so much. Yes, the sauce was amazing (I'll have to come up with a version of my own as it's a friend's recipe). Barbara, I agree! Hot fresh biscuits are the best. Hollie, a friend brought over the sauce so I have no recipe. I'll have to create one though as it was so delicious. Eviedee, aw sorry about your muffin. Thanks! Tara, I had made these just after thanksgiving so I had this amazing apple-cranberry sauce in the fridge. Yum! Finally made these this morning. YUMMY, of course! I never go wrong with any of your recipes. I do like a slightly sweeter biscuit, though, so I'll probably add a little bit more sugar in the next batch I make. Or do you think I should use Greek yogurt, instead of plain? Amy, yes, go ahead and add more sugar. I always like to use a restrained hand. I think plain yogurt would work best here as it's closer to the consistency of buttermilk. If you do try thick yogurt, I'd be curious to the turn out, however, I think the extra moisture in regular yogurt would work better.